For those of you who are pet parents, how do your pets behave in stressful situations? Are they pretty good or do they wreck havoc. Having a new baby and somewhat antsy dogs, I didn't know how they'd respond. The more nurturing and caring of the two, JR, ended up being more avoidant of baby than anything and our louder, constantly needing attention BabyPom, ended up wanting to give baby kisses all the time, despite also wanting to be held at the same time. I will admit, it's gotten a bit more challenging getting them out for routine walks while taking care of a baby and it certainly contributes to the crazy pent up energy. 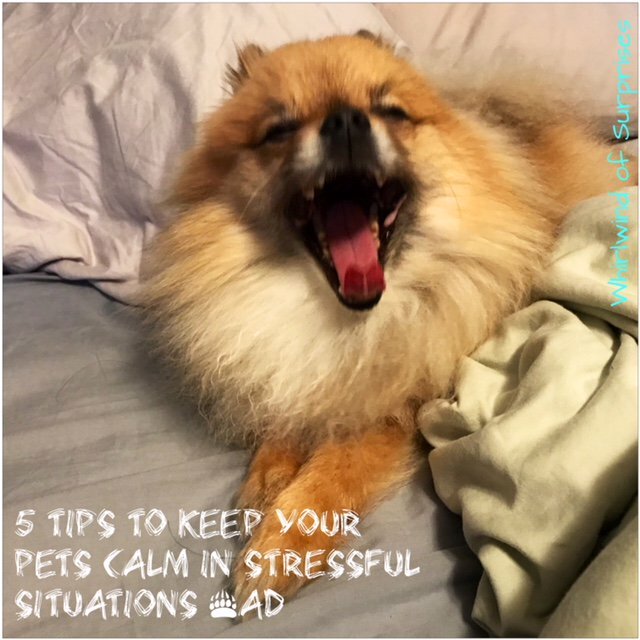 Regardless, there have been some genuinely stressful situations for the pups and I have found these 5 following tips helpful to keep pets calm in stressful situations. Let's define stressful situations. It's probably different for every dog. For ours, just having an additional family member adds to the stress. Why? Less cuddling time, less walks, loud noises. Fireworks are always a scary time, did you know pets suffer the most anxiety after the 4th of July fireworks? Visiting the vet is always stressful. Boarding the dogs is always a hard time as well as I've known mine to not eat or sleep very well when they're boarded. What about bedtime? Bedtime for some reason is another stressful time, the dogs fight for "ownership" of the bed, believe it or not. So here is how we deal with trying to manage their stress. 1) Familiar Toys/Blankets: Before we board them, I typically will sleep with a pet blanket by me so that it absorbs my scent. That way, I can leave something with my scent on it with them to help relieve their stress. We'll also pack their favorite toys to bring with along with some extra daily treats, in the case that they aren't eating as well. 2) ThunderWorks® ThunderEase Calming Diffuser Kit (Dog & Cat) -Most of you pet parents are probably familiar with the ThunderShirt®. 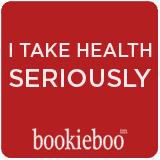 We have one to help with stressful situations naturally. However, I never knew about their new line of products until we recently tested them out. 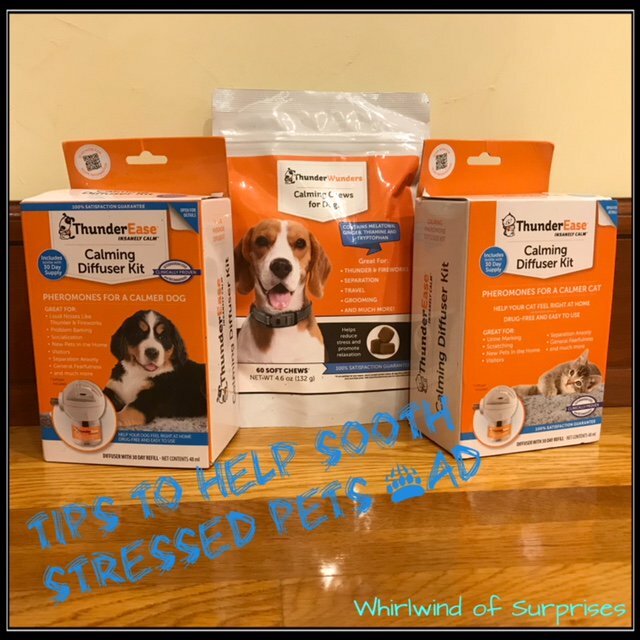 They now also have ThunderEase Calming Diffuser Kits (Dog & Cat), ThunderEase Calming Spray (Dog & Cat), ThunderEssence Calming Essential Oils (Dog), ThunderEase Calming Collar (Dog), and ThunderWunders Calming Chews (Dog). We were sent the diffusers and chews to test out. What I love about the ThunderWorks® line up is that they are natural and chemical/drug-free. ThunderEase mimics the natural "mother's" pheromones emitted by dogs and cats, thus naturally putting them at ease. It's as simple as a plug in. There is absolutely no smell to it so homeowners do not need to worry about specific smells/odors. The beauty of the diffuser is that it is for up to 700 square feet, however it does note for single room use only. I plugged mine in the kitchen as that was the more central room on my main floor and where the dogs typically hang out during the day. Refills are about every 30 days and the diffuser head needs to be replaced every 6 months. 3) Regular exercise -Regular exercise can get rid of excessive energy and help with stress levels. Like with humans, a happy dog is less likely to be stressed. 4) Routines -Dogs like people are also fans of routine. Stick with regular routines for happy, healthy dogs. 5) Treats -I tend to utilize treats in stressful situations. For example, when I leave for work, I typically give them a dental treat. I even tell them, "I love you, see you soon". One, it sets up a regular routine so they don't feel abandoned and they know that I end up coming home sometime afterwards. Two, they associate it with a treat so they're not as stressed out. 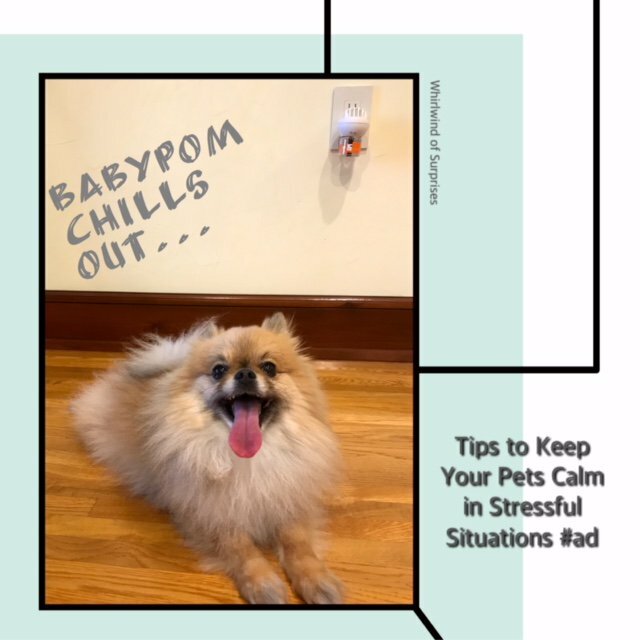 What do you usually do to keep your pets calm in stressful situations?